The SDM-CD8S adds capability to a datalogger by controlling dc devices that have a moderate current load, such as solenoids, solenoid valves, dc motors, stepper motors, lights, horns, heaters, and fans. The SDM-CD8S is targeted for applications requiring only a few control ports and where a larger, high-powered relay module (such as the SDM-CD16S) is not necessary. The SDM-CD8S has eight dc-voltage outputs and returns that can be switched on and off manually or under datalogger control. When the manual control switch is in the ON position, outputs are controlled by the position of the individual rocker switches. In the OFF position the state of the relays is controlled by the SDM commands from the datalogger. The voltage range for this device is 8 to 26 Vdc. It can deliver up to 1 A per channel with a maximum of 6 A total for all channels. The power Input (8 to 26 Vdc) powers both the outputs and the SDM-CD8S logic. The SDM-CD8S is a synchronously addressed datalogger peripheral. Datalogger control ports 1, 2, and 3 are used to address the SDM-CD8S, then clock out the desired state of each of the 8 control ports. Up to 15 SDM-CD8S Controllers may be addressed, making it possible to control a maximum of 120 ports from the first three datalogger control ports. CR9000X Although the CR9000X is compatible, the SDM-CD8S does not support its fastest communication rates and therefore is not practical for most of its applications. 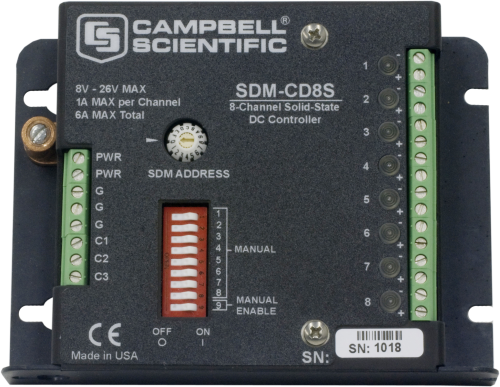 The SDM-CD8S power requirements may be large compared to most Campbell Scientific products. For most applications, an external power supply is recommended to power the SDM-CD8S. For some applications, it may be convenient to use the data logger’s sealed-rechargeable battery. If the data logger’s rechargeable batteries are used, the batteries need to be float charged via a wall charger or solar panel. The current available from the wall charger limits the SDM continuous output current. Campbell Scientific does not recommend using the data logger’s alkaline power supply. The SDM-CD8S requires a desiccated, non-condensing environment; a Campbell Scientific enclosure is recommended. Grommets and screws are provided to attach the flanges/bracket to the backplate of our enclosures. If an SDM-CD8S or SDM-CD16S is used to switch an inductive load (solenoid), is a diode needed to protect against voltage kickback, or is one already built into the device? The SDM-CD8S and SDM-CD16S were specifically designed to switch solenoids (inductive loads), similar to those found on valves. The diode, to protect against voltage kickback, is built into the device. The SDM-CD16AC, however, does not have this diode. Is there a manual override on the SDM-CD8S or SDM-CD16S? Yes. Each of the channels on the SDM-CD8S and the SDM-CD16S has a manual control switch. Place the SDM-CD8S or SDM-CD16S into manual control by switching the Manual Control switch to the On position. Now each channel can be turned on or off using its respective switch. Can multiple SDM-CD8S or SDM-CD16S devices be connected to a single datalogger? Yes. SDM devices are addressable. Multiple SDM devices can be connected to a datalogger, as long as they all have a unique SDM address. Valid addresses are 0 through 15. Address 16 is reserved for SDM devices that support the Group Trigger Command. The address is set using the rotary switch on the face of the SDM-CD8S or SDM-CD16S.